Aida is one of the most frequently used types of fabric for cross-stitch and other counted stitches embroidery types. This is due to the fact that it has an open and even weave with a natural mesh that makes cross-stitching easier and it is stiff enough so that there is no need to use an embroidery hoop. Aida tapes are used to place cross-stitched decoration bands in different sewing projects. They are common when making baskets for the newborn, decorating kitchen towels, bath towels, aprons, and other similar projects. They usually have a laced edge, which might have the same color as the fabric, or a different color for contrast. The panama ribbon is made of cotton. 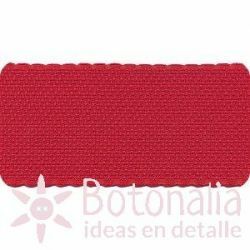 Product Description: Aida tape in redWidth: 50 mm.Content: Price is per 1 m. of ribbonComposition: 100% cotton. Product Description: Aida tape in greenWidth: 50 mm.Content: Price is per 1 m. of ribbonComposition: 100% cotton. 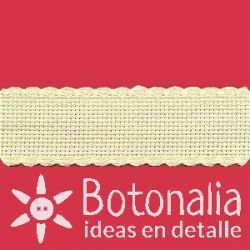 Product Description: Aida tape in red with a golden edgeWidth: 50 mm.Content: Price is per 1 m. of ribbonComposition: 98% cotton 2% lurex. Product Description: Aida tape in green with a golden edgeWidth: 50 mm.Content: Price is per 1 m. of ribbonComposition: 98% cotton 2% lurex. Product Description: Aida tape in whiteWidth: 50 mm.Content: Price is per 1 m. of ribbonComposition: 100% cotton. Product Description: Aida tape in beigeWidth: 50 mm.Content: Price is per 1 m. of ribbonComposition: 100% cotton. Product Description: Aida tape in whiteWidth: 30 mm.Content: Price is per 1 m. of ribbonComposition: 100% cotton. Product Description: Aida tape in beigeWidth: 30 mm.Content: Price is per 1 m. of ribbonComposition: 100% cotton.